Weddings are held from mid-May through early October. Download our Wedding Packet for more details here. 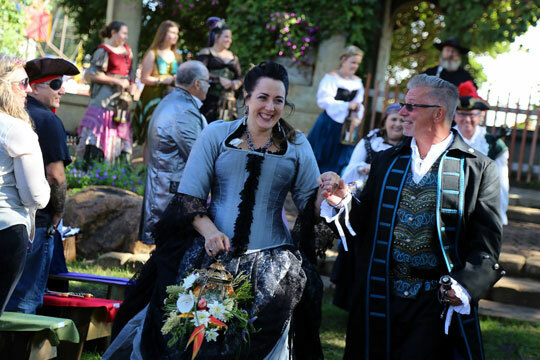 Weddings are held mid-May through early October when the Renaissance Festival is closed, allowing you the luxury of an intimate celebration on our beautiful grounds. 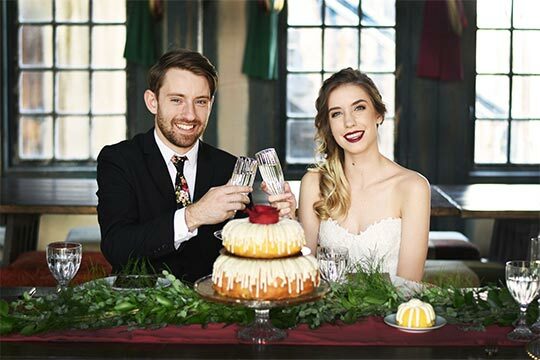 You may choose to have your ceremony at any of our 12 outdoor stages and your wedding reception may be held in Bad Manor, an indoor banquet hall which seats up to 150 people. A tent can be rented at an additional cost to accommodate larger parties. Wedding Coordinator for pre-wedding questions and day of event coordinating is provided. Ceremony and Reception areas are provided especially for weddings. Ceremonies can be held at our Chapel Garden, King’s Arbor Stage or Secret Garden. Receptions are held in a large enclosed tent. Bad Manor is only available during the Festival if you hold your reception at the Feast of Fantasy, a daily ticketed event at the Festival. We can accommodate any other aspect of your wedding celebration such as showers and/or grooms dinners.